10 Tips to Take Your Emails to the Next Level! You’re in for a treat, because today I have for you a unique email session with the most important tips, tools and techniques you need to make your emails appear both friendly and professional. If you communicate with your customers via email, you can’t afford to miss this! The subject line is your first impression in email communication so make sure your first impression is personal and attention-getting. By far, the most common subject line in email responses to customers is: “Re: customer web inquiry”. Sure, it’s accurate, but what a waste of opportunity to connect with customers and make your communication memorable. Joe, the lawn mower manual you requested is attached. Lynn, your replacement widget will ship tomorrow. Lauren, here are tips to help maintain your garden. Personalize your emails and they’ll be read before anything else in the customer’s inbox. I guarantee it. Now, when you personalize subject lines be sure to keep it short. Subject lines should be no more than 60 characters. It’s just fine to use fragments in subject lines as long as you’re clear. 2. Open with a friendly salutation. A lot of companies begin complaint response letters with: “We have received your email dated…” Don’t do this. The fact that you’re responding to the email is irrefutable proof that you have received the customer’s letter. 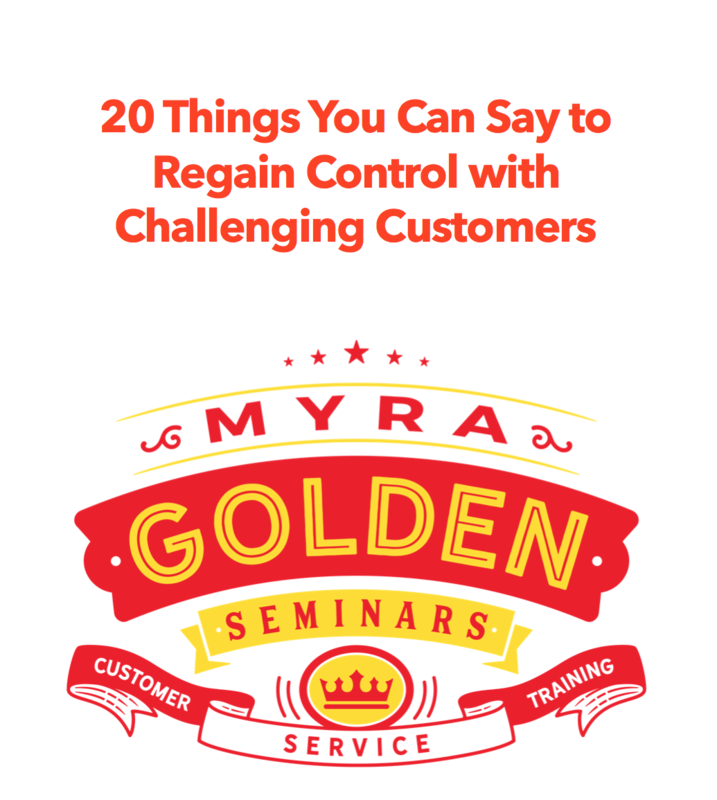 Instead of wasting words, immediately go into a response designed to restore the customer’s confidence and regain their goodwill. The Franklin Covey Style Guide suggests, “Probably no single language choice is as effective in making business documents human and personal as well-chosen pronouns.” And this style guide is absolutely right. Using personal pronouns like I, Me, You, and We make your emails more conversational and friendly. Take a look at this excerpt from an actual email to a customer. The customer sent it to me and raved about how awesome the email was. What made it great was the use of personal pronouns by the customer service rep to make it real and establish rapport. services. We assure you that customer satisfaction is our top priority and we want the service at our studios to reflect that principle. We realize the importance of having portraits taken and the time and effort involved in preparing for a sitting. As a mother of three children I can certainly understand the frustration and disappointment you had with having to wait so long and then not having the quality sitting you are entitled to. Ms Golden, I’m so sorry the Canon Vixia HV30 MiniDV HD Camcorder hasn’t been processed as of yet. I know you’re anxious to have this completed. The return processing time can take up to 17 days from the date an order is returned to QVC. I hope your item is processed soon. What I especially loved about this response was, “I know you’re anxious to have this completed.” And “I hope your item is processed soon.” Show a little empathy and personal concern in your emails and soon your customers will be raving about you! Taking the time to explain to customers what might have caused the problem helps you re-establish trust. Here’s how Jet Blue explained what happened in an apology letter to its customers after a pretty big fiasco. Answer ALL questions – this is a BIG one. Customers find it frustrating to get an incomplete response from the company. Carefully read and re read the customer’s email to ensure you have captured every issue and make sure you respond to each of the issues. Certainly, it’s going to take more time and effort on your part to pick up the phone and call a customer to communicate bad news, but you really need to make the sacrifice. Speaking to the customer by phone gives you the opportunity to establish rapport, re-build trust, offer alternatives, or to offer a sincere and unreserved apology. Email communication is so vulnerable to miscommunication and you are at great risk for losing the customer when you convey bad news electronically without the opportunity to truly defend your position. P.S. As a concrete form of apology I am sending you two additional widget kits. You can enjoy one now and one later. Thanks for being a loyal Widget Company customer! P.S. I wanted to let you know that right now we’re running a special. When you buy 2 widgets, you get a third widget at absolutely no charge—and we pay the shipping. This may be a great time to pick up a widget up for you, your mother, and a special friend! P.S. You are always welcome to call me with any additional questions. My direct dial number is 443-982-1131. 10. End your email on a friendly note. Adopt and apply these simple tips and your emails will grab your customer’s attention, be memorable, AND they will help you build and strengthen loyalty with your customers!